Bruce still plays an integral role in the company and heads our talented design team. He makes trips to various airports to get patterns off new and classic aircraft. He spends most of his time designing in 3D, but also contributes to database optimization and streamlining production processes. Would you like to meet Bruce? He wants to meet you too! Click HERE to meet him. What features should I look for in a protective cover for my aircraft? First, a canopy cover should be 100% lined with a microfiber lining wherever the cover touches the glass. Second, a cover should be made of a breathable material so it will not trap moisture and condensation under the cover, which could cause the paint and/or metal to oxidize over time as well as cause your glass to have a smoky or cloudy appearance. Third, a cover should be made from a material that reflects the harmful UV sunlight in order to protect your paint, fabric, and composite. This will keep the interior of your cockpit/cabin cool; protecting your avionics and upholstery as well. Fourth, a cover should be form-fitting and made to fit your specific aircrafts’ fuselage so it will not chafe or bang against the glass and/or paint on a gusty day. 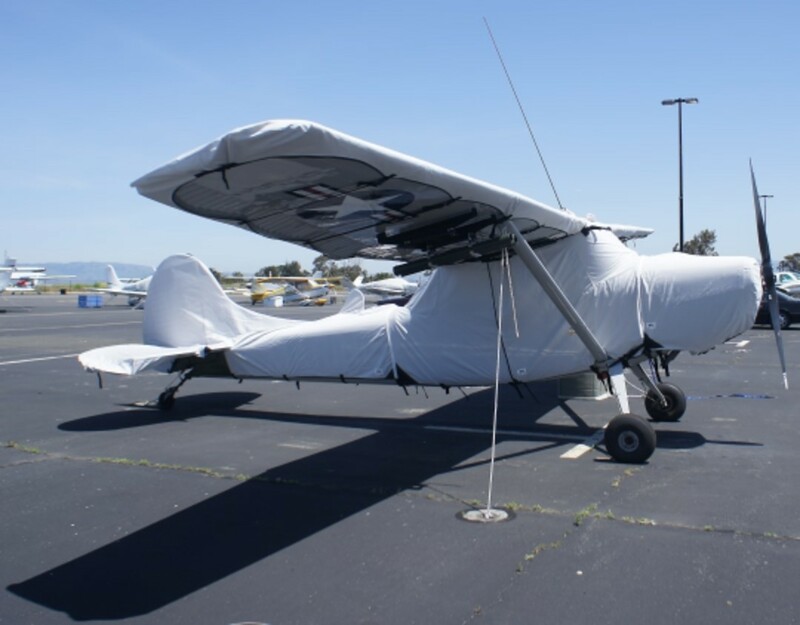 Last, you should get a cover from Bruce's as we have over 35+ years experience in manufacturing the world's finest custom protective covers for airplanes, gliders, jets and helicopters. What material/s do you use for your covers? Here at Bruce's Custom Covers, we perform extensive in-house weather testing on all of the fabrics we use. We have an industry standard Accelerated Weather Testing Machine called a Q-Panel. This machine can simulate UV sunlight exposure and condensation. We perform pull tests and abrasion tests with our fabrics. We conduct tests to calculate insulating properties and r-values of our materials. We also conduct and design experiments to test water repellent qualities of our materials. We hold a high standard for our suppliers and require that they always provide us with Material Specification Data Sheets (MSDS) that display independent test results and material performance. Over the years we have discovered that an acrylic solution dyed canvas material, like Sunbrella®, primarily used in the Marine Industry for boat covers, is the most suited, for the majority of climates, for protective aircraft covers. Our standard canopy covers are made with our own Acrylic Laminate fabric, which was specially designed and constructed for our covers. A Solution Dyed Polyester fabric like WeatherMax® also performs extremely well in very specific climates and situations. Most of the fabrics we use have a manufacturer's warranty of 5 years, should the cover become unserviceable due to color or strength loss from normal usage and exposure condition, including sunlight and mildew. Our standard covers are meant to be used year-round, 100% of the time outdoors. Your cover life will depend on where you live and how you care for the cover (Click HERE or see FAQ below for Care Instructions). Tropical and humid climates like Florida and Brazil tend to be the harshest climates for any type of material. Alaska and Canada experience strong winds, thawing and freezing, snow and icing conditions, which is why we choose the best Acrylic and Polyester fabric mixes in the industry. You do not want a cover made from waterproof material like a plastic tarp. Waterproof materials do not breathe and will trap moisture and condensation underneath the surface of the cover, which will cause damage to the glass, fabric (like Ceconite), paint, and/or composite. Our covers are treated to reflect the harmful UV sunlight and are highly water repellent. The material is water repellent enough to stop any leaks in the canopy and door seals, yet are breathable. This means that condensation is allowed to breathe through the cover or wick away off of the surface of the plane. After a heavy rain, you may feel some slight dampness on the underside of the cover. This moisture will not be trapped under the cover, instead it will breathe out and dry quickly. We would not sell you a Standard Canopy Cover that is unlined. The prices for our Canopy Covers, all listed on our website, include a cover that is custom-fit, that accommodates for all antennae, aerials and protrusions, lined 100% with a soft and smooth microfiber lining that will not scratch your glass or paint. In some instances like Wing, Tail and Empennage surfaces, it is unnecessary to line the covers. Our covers are very form-fitting and will not chafe these surfaces. These are large covers and we save nearly half the bulk and weight by not lining these covers. Also, these covers do not touch Plexiglas surfaces, which require a microfiber lining. We also offer a line of lightweight travel covers that are made of a lightweight polyester fabric. These covers are only lined on the windshield. The fabric that we use for these covers is very soft and does not require the cover to be fully lined. This also saves bulk and weight for easy storage during travel. We can fully line these covers for an additional charge. Just give us a call to discuss. All of our covers are custom-fit and patterned directly off of each aircraft model or off of manufacturer's engineering CAD schematics for each model. 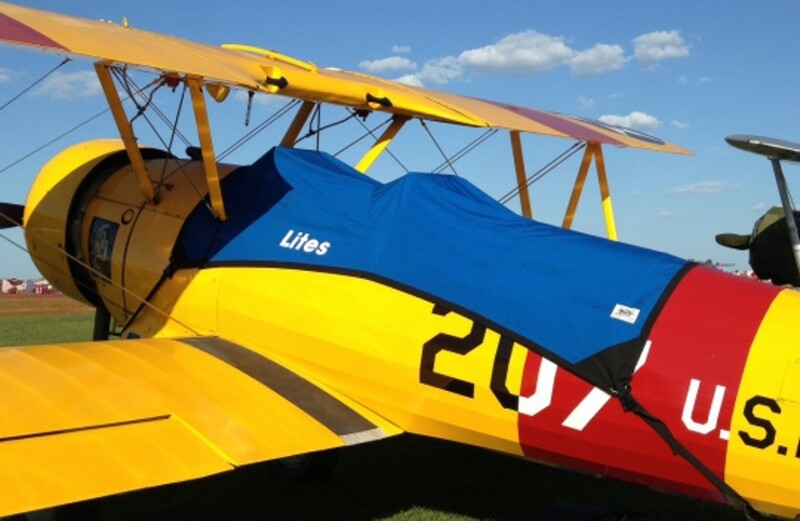 Bruce's Custom Aircraft Covers are designed to be form-fit. The most prominent mistake that we see out on the ramp at all the airports we've visited over the years is that pilot's, for some reason, tend to not cinch the cover tightly over the aircraft surface. Our covers are intended to be able to be cinched tightly. Our Cockpit/Canopy/Cabin Covers are automatically lined 100% with a soft and smooth microfiber lining to help prevent scratching. We also sew in a pre-taught shock bungee chord around the entire perimeter of the cover that also ensure the cover will hold tightly against the aircraft surface when the straps are properly adjusted. We cannot control when an operator does not properly tighten the straps of our covers. But, when installed properly on a clean windshield, you should not have any problems with scratching your glass. 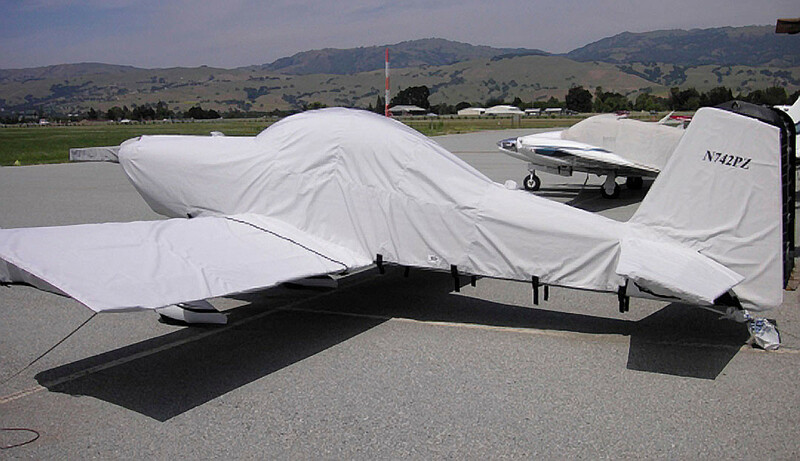 We'd be out of business if we were scratching peoples' aircraft and many OEMs like ROBINSON HELICOPTER and CESSNA would not trust us as the OEM aircraft cover manufacturer if our covers didn't work. 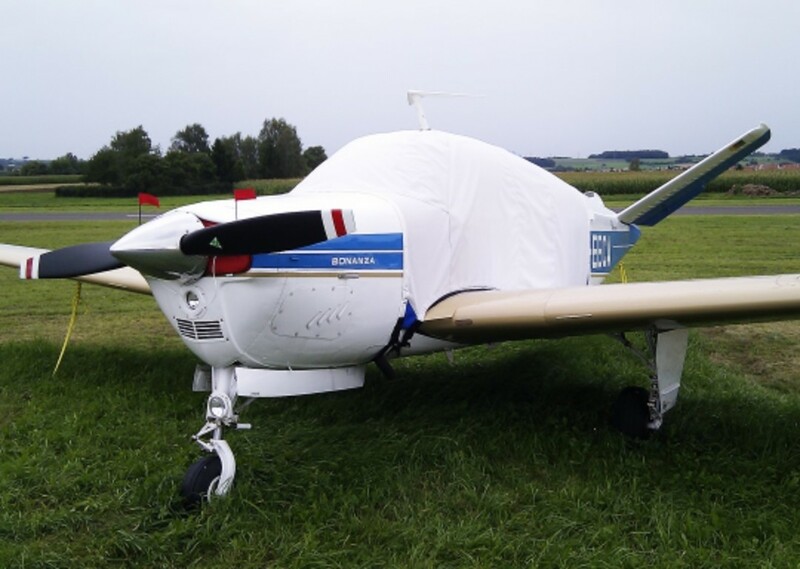 Please be careful about imitators and inexpensive aircraft cover manufacturers that sell their cheap covers online on eBay and other discount ecommerce sites. 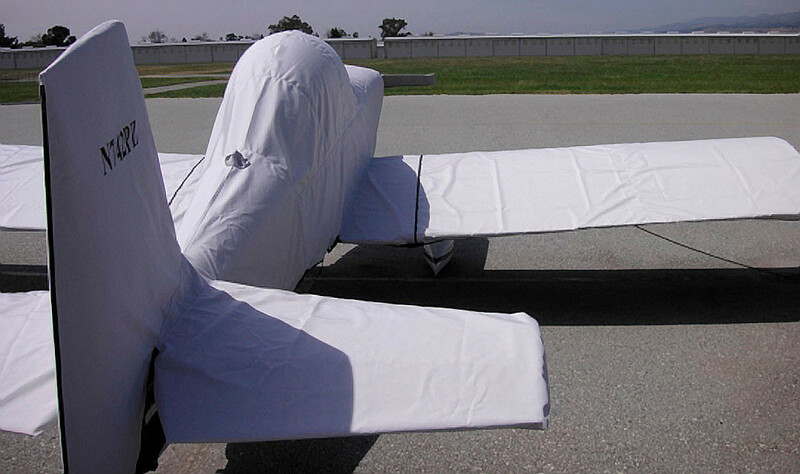 These covers are often designed very poorly, will flap against your aircraft surfaces in the wind and are many times unlined over the windshields. Our warranty is unconditional for craftsmanship and workmanship. We make custom-fit covers. If you are dissatisfied in anyway with the FIT of the covers, we will work with you to redesign our patterns until you are satisfied with the fit of your cover. If you instead would prefer that we give you a full refund due to the fit of the cover, we will take the cover back and give you a full refund, no questions asked. However, if there were no fit issues or fabric defects with your cover, but you would still like to return it, a 30% restocking fee will be assessed once the cover is returned to our Morgan Hill office. All repairs are free for the life of the cover, but the life of the cover can vary widely depending on which material is being used. Our light weight Travel Covers or our even lighter Spandex covers will not last long if used outdoors for prolonged time periods. If the base material is structurally sound, and not threadbare, we will repair your cover at no charge. If, for some reason, some of the stitching comes undone, you may send the cover back to be re-stitched at no charge. If you change the configuration of your antennae, due to an aesthetic change or new avionics package upgrade, you may send the cover back for free alteration. You must only pay for the shipping back to our shop. We will then repair the cover and return it to you at no charge. If the cover or engine inlet plugs do not fit the first time around, we will email you a UPS label and we will remedy the fit issue. Does the cover come in colors? Is that extra? We can make you a cover in a variety of different colors. 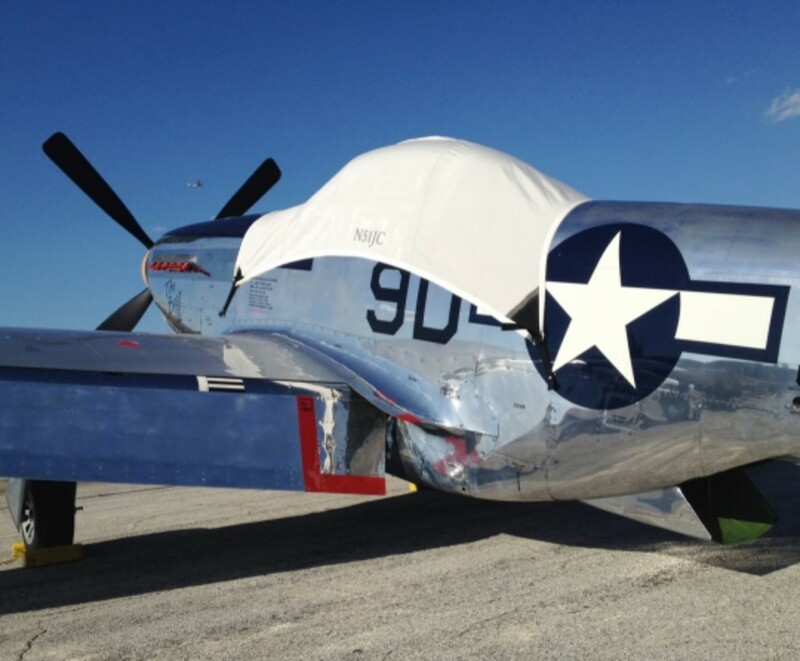 If you purchase a cover made from Silver-colored Sunbrella®, we automatically trim the corners of your cover to match the paint scheme of your aircraft. On our Helicopter Cover line, we trim the Left Aft Corner in RED (RED = Aircraft Left) and the Right Aft Corner in GREEN (GREEN = Aircraft Right). The trim colors at the corners of the cover on an airplane cover also serve a purpose. The forward corner trim is smaller and the aft corner trim is larger so you can orient the cover on your plane when you remove the cover from its storage bag. If you want a custom color, please contact us with your request and we can let you know if the color is available and what the additional cost would be. Click HERE to see the Chart of Available Colors. Does my tail number, call sign or registration number come on the cover? How about my company logo? 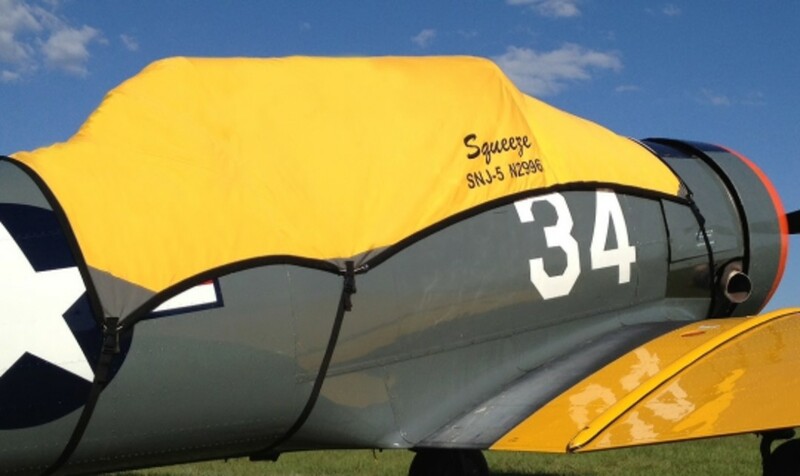 We can imprint your aircraft registration number on both sides of any canopy cover for a $30 charge. We can also imprint your company logo and/or aircraft registration number in a solid color or full color. This price varies, primarily on how much time it will take our dedicated art department to render your company logo. We will need for you to EMAIL US your company logo in high resolution as an AI, EPS, JPG, GIF, TIF, PNG or PDF file. Can you cover my entire airplane, glider, jet or helicopter? Yes. For most airplanes, we can cover the Cockpit/Canopy/Cabin, Engine Cowling, Wings, Empennage/Tail section and Propeller/Spinner. 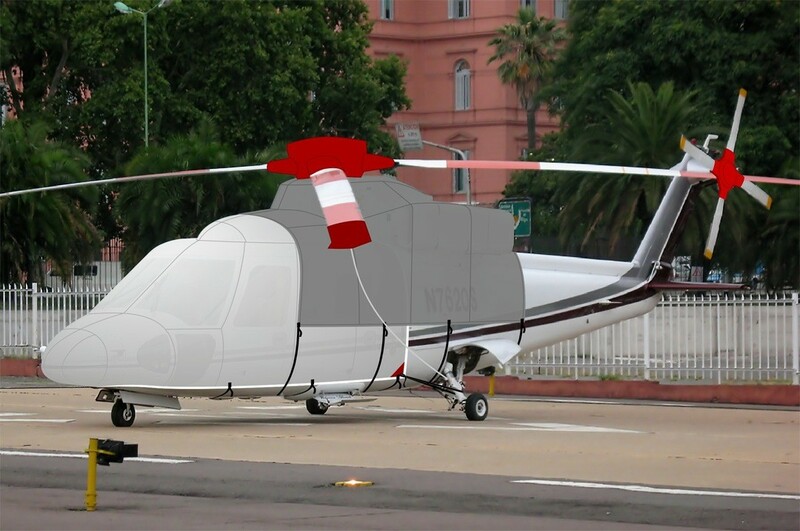 For most helicopters, we can cover the Nose/Cockpit/Cabin, Engine Area, Main Rotor, Rotor Blades, Tailboom/Notar, Stabilizers, and Tail Rotor/Fenestron. 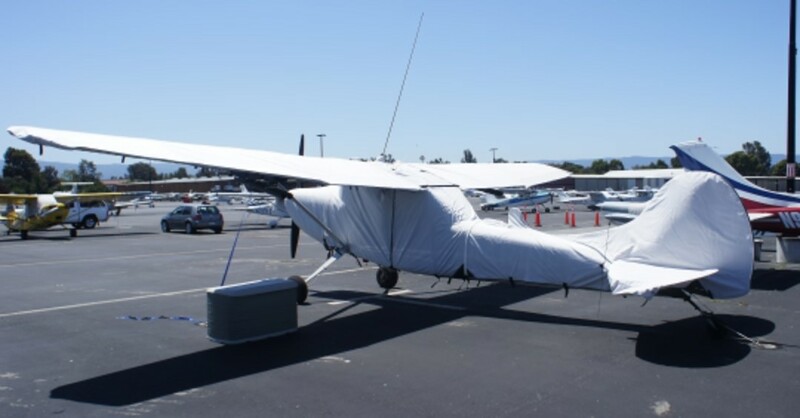 Prices will vary on the cover combinations required to cover your entire aircraft, design complexity, as well as the aircraft size, hence the size of the covers. Click HERE to contact us for a quote! 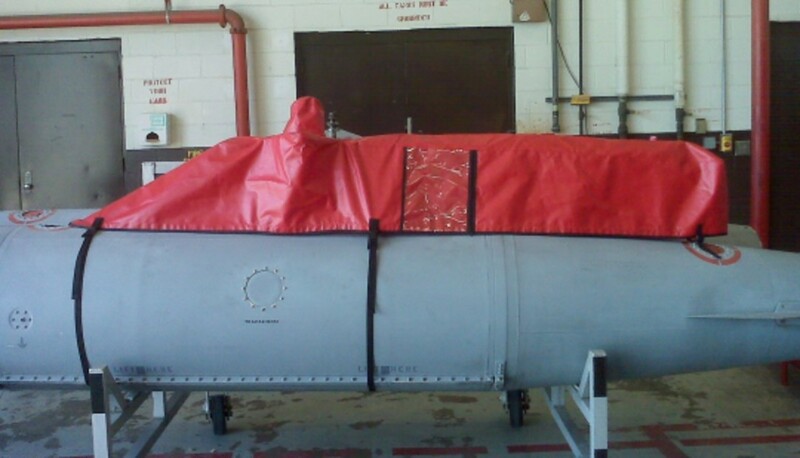 How do I store my cover once I take it off my aircraft? Does my cover come with a bag? All of our Canopy/Cockpit Covers, Bubble Covers and Jet Engine Covers come with their own cinch-style stuff sack. Usually, we will include a slightly oversized bag that will be large enough to hold any additional items like Engine Inlet Plugs, Prop/Spinner Cover, or a Pitot Cover. Most covers will easily fold to the size of a small to medium sized sleeping bag. To keep your cover(s) in good shape, its recommended to hand wash the covers with a mild soap, like Woolite® or Ivory Flakes®. Use a bucket of water and a soft-bristled brush or sponge. Hose off the cover, scrub it down (be more gentle on the inside microfiber lining), hose it off again, and line dry it. You may view a more thorough instructional video on Cleaning and Care Instructions HERE. Do not commercial wash, dry, or dry-clean your covers. Those processes will prematurely deteriorate the material by breaking down the UV and water repellent inhibitor treatments that are already incorporated in the material. If you have a huge cover, or the covers are very dirty, you may remove all attachment buckles and wash the cover in a front-loading machine that has a hand wash or delicate cycle, using mild soaps. Do not machine dry the cover. If, after a couple/few seasons, your cover seems to be losing its water repellent qualities, contact us and we'll send you a free bottle of UV and water repellent treatment that you can spray on your cover. The UV and water repellent treatment is similar to Scotch Guard (Click HERE for more information on the fabric treatment), however it is made specifically for Sunbrella®. Re-treating your cover with the UV and water repellent treatment is by no means a "cure-all" solution, however it does help to prolong the life your cover. 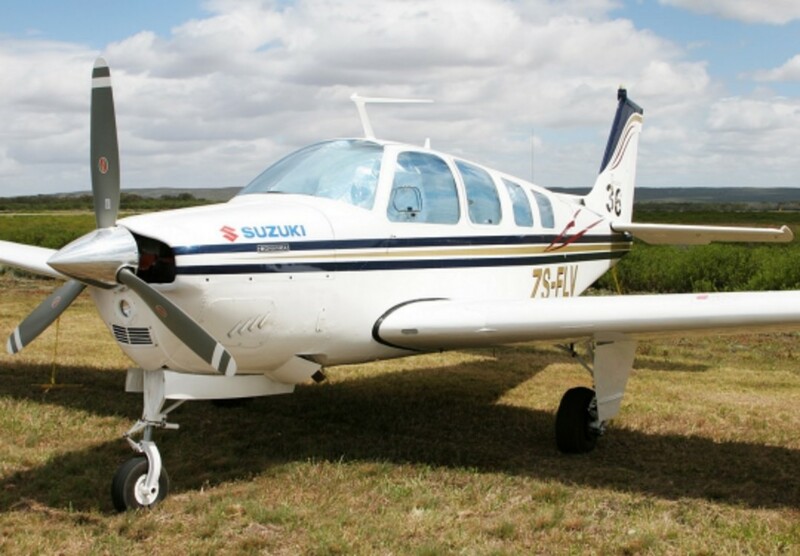 Would you recommend Sunshades/HeatShields over a cover if I keep my aircraft in a hangar and only use covers for day and cross-country trips? We would only recommend using sun shields 'HeatShields' for temporary use during day trips or for a couple of hours at a time during a short layover. If used too frequently over time, the silver reflective surface can cause damage to your Plexiglas windscreen and laminated windshields as it traps heat in between your glass and the HeatShield. Additionally, more times than not, the HeatShields are more difficult to install than an Exterior Canopy Cover. Imagine having to crawl around a cramped cabin of a Cessna 182 or Piper PA-28 to install a HeatShield in every window instead of installing a cover over the exterior of your plane. 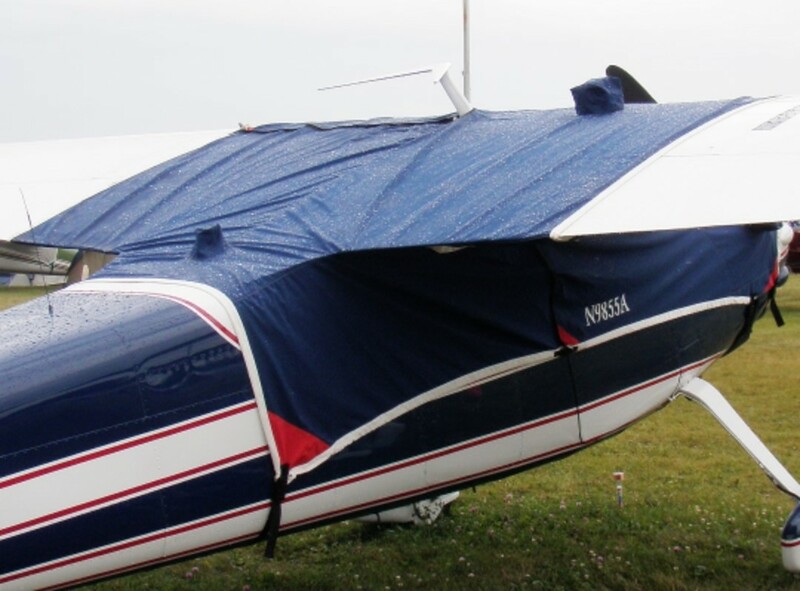 Exterior Canopy Covers are a more effective protective solution for your aircraft. While being equally effective at keeping your cabin/cockpit cool and protecting your avionics panel and upholstery as a HeatShield set would, exterior covers by Bruce's will protect the exterior of your glass and paint and will also stop any leaks in the canopy or door jamb seals. With over 15,000 patterns and products, it would virtually impossible to stock or inventory our custom-made product. We therefore make everything to order and generally customize the product for your aircraft. We can also personalize the covers with your registration number or match the color of the cover to your paint scheme. Depending on the item ordered and how busy we are, our lead-time generally fluctuates from 1 to 4 weeks, from the time we receive all of the information that we need to begin production. If you need your cover in a rush, due to a departure date or inclement weather, we try to work with you on our lead-time by speeding up your particular order. In some extreme conditions when you need your cover to be made in less than a week and 'over-nighted' to you, we will have to apply a rush fee. Standard shipping rates apply. I don't see my aircraft model or manufacturer in your parts catalog list. 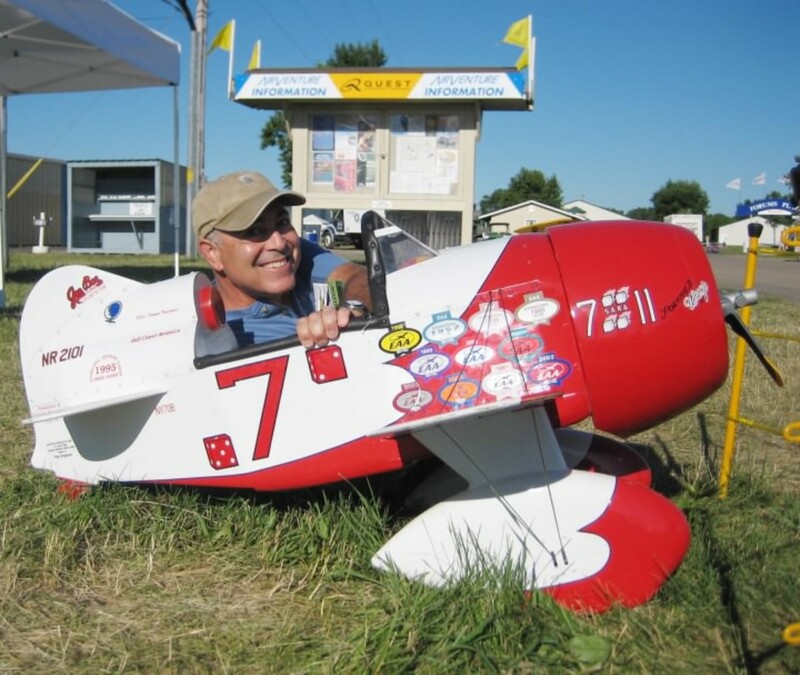 Do you make custom covers for my one-of-a-kind plane, homebuilt, antique plane, experimental aircraft, kit-built or rare aircraft? If we do not have a pattern listed on our website for your aircraft, the best place to start is to e-mail us some photos of your aircraft to BRUCE and/or to follow up with us by phone. We have perfected our CAD design techniques over the years. In most cases, we can now design custom-fit protective covers for your aircraft remotely, without seeing an aircraft in person. We will require you to email us walk-around photos of your aircraft and possibly to take exacting measurements for us at key fuselage stations. We can usually communicate exactly what we need from you in an email or by phone in order to make the experience as painless as possible. Do you do custom work for my motor home or outdoor BBQ? Unfortunately we do not. We are a small business. This would take much valuable time away from our core competencies and from serving the aviation industry about which we are very fond. We like to stick to what we know, which is making world class protective covering systems for airplanes, gliders, jets, helicopters, off-link jet engines and GSE. Do you make OEM, Private Label and/or Co-branded covers for aircraft manufacturers, fixed base operators and maintenance/service centers? We sure do. We offer wholesale discounts to distributors, manufacturers, and FBO's that order in quantities. We have the ability to create our own designs that meet your specifications or customize designs to spec based off of 3D CATIA, SolidWorks and Rhino files or based off of 2D Engineering Schematics and 3-views. We can imprint company or manufacturer logos on the covers. In special cases, we can private-label covers to meet your marketing or OEM requirements. The best way to meet your specific needs is to discuss this with us over the phone or through e-mail. Please do not hesitate to give us a call and speak to one of our sales team members, Monday through Friday 8AM - 5:00 PM PST. We now have a Live Chat feature on our website, which can also be useful during our business hours. Do you sell to the Military? If so, how can I purchase your products? We do sell to the Military and other government organizations worldwide. Most of our products are listed on our website or you can call or email us for availability or pricing. Many units purchase products for their specific fleet requirements with their government issued GPC / IMPAC cards or are billed Net 30 through the Wide Area Work Flow, WAWF. 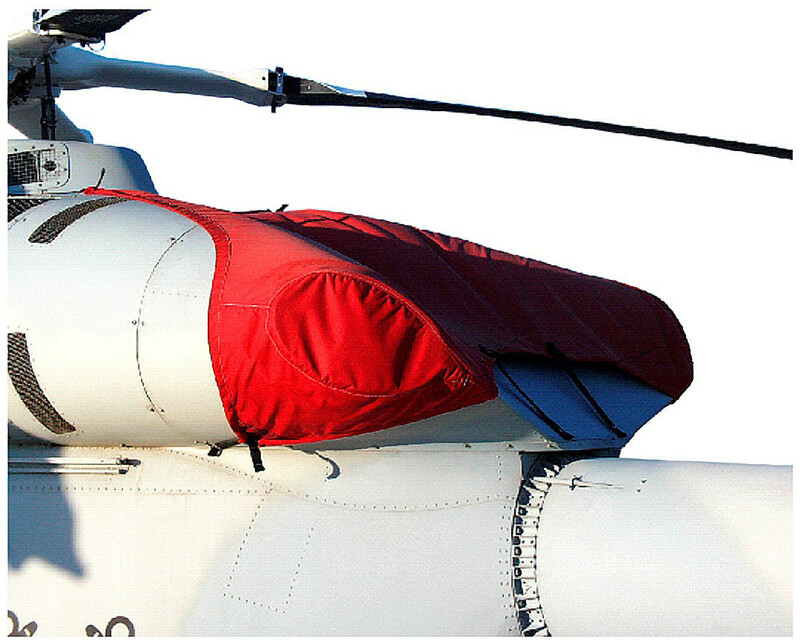 While you're here, please take a look at the section of our website dedicated to our Military Aircraft Covers product applications http://www.aircraftcovers.com/military/. Included in this section are photos and product specifications. You may order here or call us directly, which is easier in most cases. Please do not hesitate to submit a sole source RFQ or give us a call for a quote that will satisfy your Form 9 requirements. Also, do not hesitate to contact us by phone, email or Live Chat with any questions. 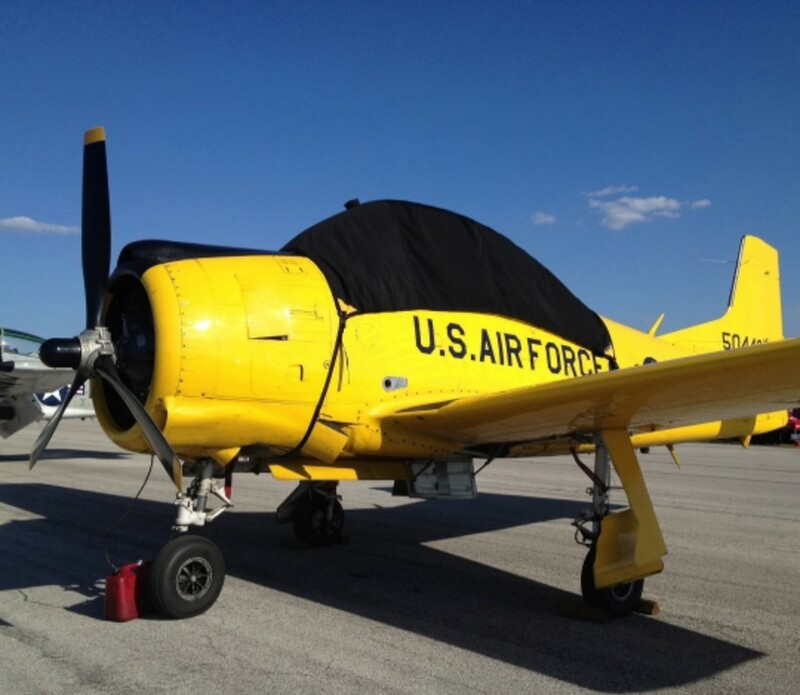 Company Name: Aircraft Covers, Inc.
Do you make covers for Ground Service Equipment (GSE) or Off-link Engines mounted on engine stands for maintenance, overhaul, long-term storage or transport? We do. We make AOG and RON FOD protection covers and plug assemblies for Jet Engine Intakes and Exhausts for all Boeing, Airbus, McDonnell-Douglas, Embraer, Canadair, ATR, Beech/Raytheon, and De Havilland commercial air carrier aircraft. 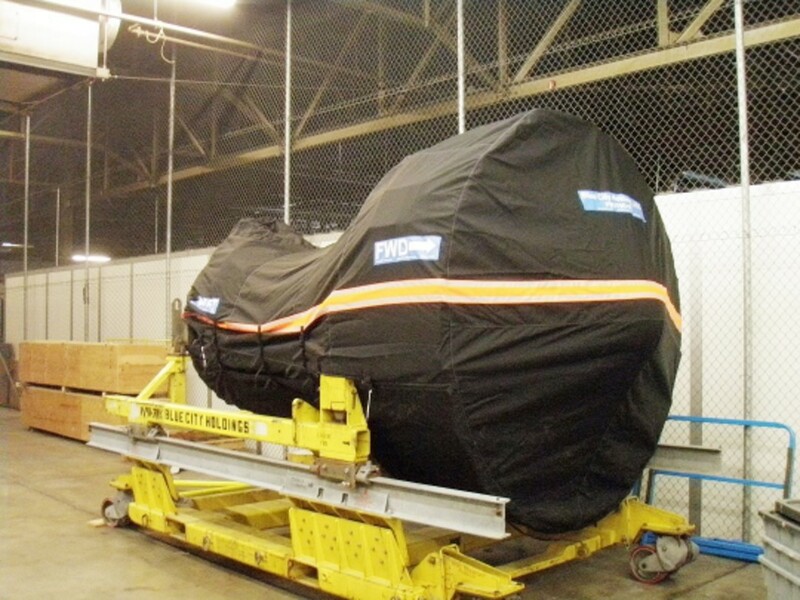 We make custom protective covers, tarps and bags for all engine manufacturers. 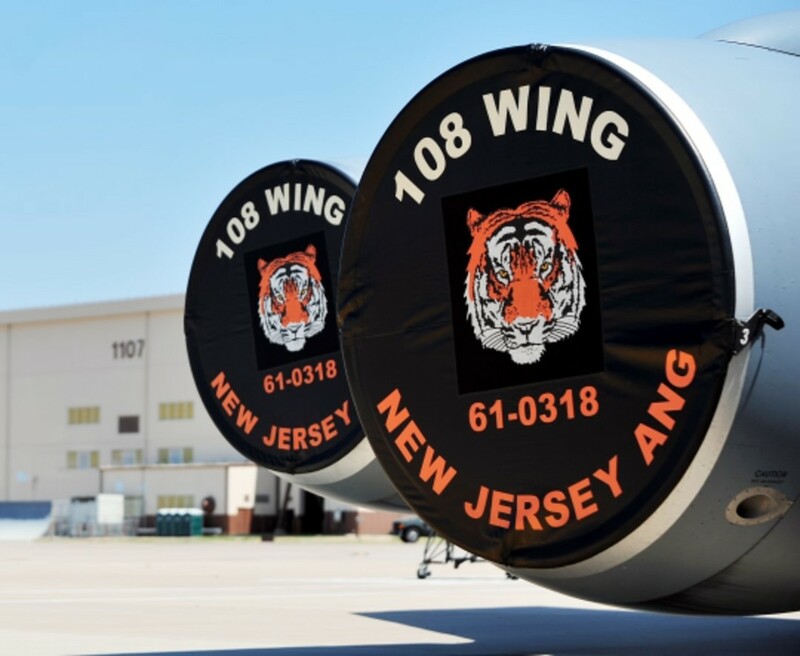 We make CFM engine covers and engine bags, General Electric GE engine covers and engine bags, IAE engine covers and engine bags, Pratt & Whitney PW engine covers and engine bags, Rolls-Royce RR engine covers and engine bags, and Allison engine covers and engine bags. We make custom protective covering systems for Ground Service Equipment GSE. 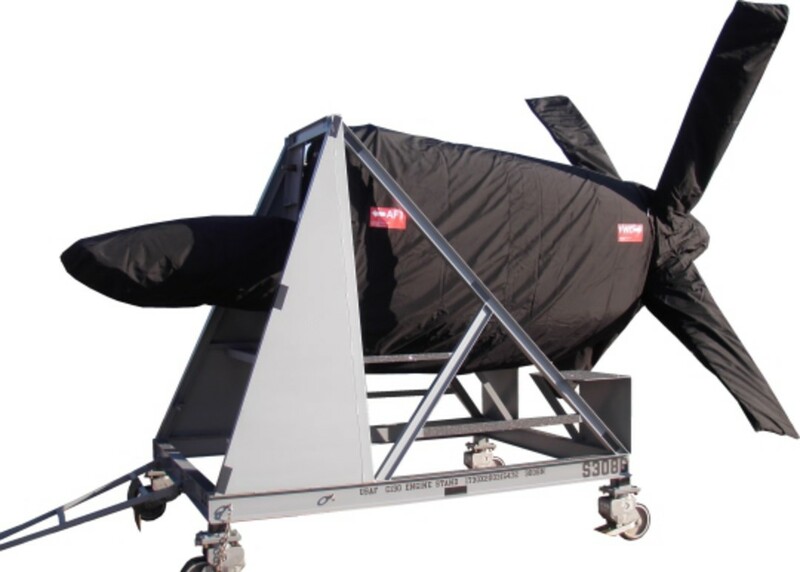 We make Tripod Jack covers, Skydrol Mule covers, Engine Wash Cart covers, Portable Welder covers, Portable Generator covers, O2/N2 Serving Cart covers, Engine Wash Cart covers, plus many more. Our long-term storage or protective covers can be customized for any application. How do you protect my personal information once I place an order with you?